A happy and successful event took place on Monday, September 24, Our Lady of Mercy Day. This was the annual gathering of Year 4 students and their teachers from the local Mercy Schools : St John’s Lambton; St Thereses’s New Lambton; St Columba’s Adamstown; St Patrick’s Wallsend and St James’ Kotara. 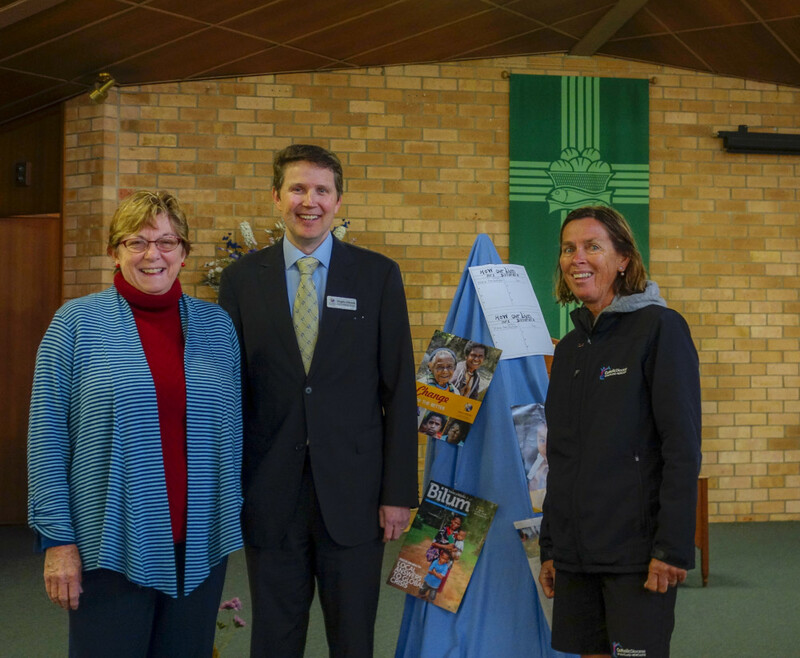 During the past 5 years, Helene O’Neill and Maureen Rak have visited the schools during term 3 to present workshops on behalf of Mercy Works. Mercy Regional Day is the culmination of this project that recognises the traditions of Mercy in these schools, instructs the students and teachers of the life of Catherine McAuley, tells of the projects of Mercy Works and encourages the students and teachers to respond to the invitation to be involved and help in these projects. Over the years, the Sisters of Mercy have gathered on the day, participating in the liturgy, speaking of their vocation and enjoying morning tea with those gathered. Year 10 students from St Pius X High School Adamstown have led sport activities with the students. It is with such help and support that the schools’ visits and the regional day have succeeded. There is a sense of belonging and an enthusiasm to enjoy and participate! And there has been a response to help Mercy Works projects for pre-schools in Timor-Leste and Alice Springs, and refugees at the Mercy House of Welcome In Adelaide. This year, we welcomed Kingsley Edwards, from Mercy Works in Parramatta. Kingsley spoke of his work and expressed appreciation to the teachers and students. We look forward to next year and our ongoing involvement with the Sisters, the schools , the students and Mercy Works.